Last week the origin story for the second member of Marvel's Defenders released in full on Netflix and it's another hit for Marvel TV. Jessica Jones (Krysten Ritter) joins Matt Murdock a.k.a. Daredevil (Charlie Cox) as another street level hero serving justice in Hell's Kitchen and where the latter already has a second season on the way for early 2016, Jessica Jones might not get a second season - at least not for a while. And it's not because its internal Netflix numbers, social media trends, or critical responses don't justify it. Here at Screen Rant we labeled Jessica Jones as Marvel's most compelling TV series yet. It's simply a matter of scheduling. Jessica Jones showrunner and boss Melissa Rosenberg, who's been attached to the project since it was originally intended as an ABC production years ago, spoke with THR and answered the question of whether or not Jessica Jones season 2 could be in the cards for release before The Defenders. Needless to say, it's not a sure thing like it was for Daredevil. "I hope so. There certainly is storytelling wise. The question becomes is there actual time? There are logistics involved, because Defenders has to shoot by a certain time, contractually. Actually, I'm not sure; I'm not at all involved in those conversations, much to my dismay. The first question is whether or not we will even get a second season. The second question is, if so, when? Will it be before The Defenders or after? I'd certainly love it to be before but there are things that play into that — time, availability." By "contractually," Rosenberg is likely referring to Marvel TV's deal with Netflix which was originally for four new original character series and a Defenders miniseries. We don't know the dates of each series and it's not set in stone according to Marvel but we can assume the Defenders must release by a certain date for the larger franchise implications (i.e. The Defenders must form before Avengers: Infinity War). If rumors and early reports are true about Marvel's master plan for the two-part Avengers: Infinity War, the first half may not include any of the original Avengers heroes and instead focus on new characters like Spider-Man, Captain Marvel, Doctor Strange, etc., and perhaps even The Defenders serving as New Avengers. If there's any truth to that, The Defenders need to be established not only on their own with their individual character series, but as as team of gifted vigilantes which is what The Defenders hopes to be. Since Jessica Jones will be a key member of The Defenders, does that mean Rosenberg will be involved? "I'm a complete control freak when it comes to this character. I will do everything in my power to protect the character in whatever forms. They'll have to throw me kicking and screaming out of that building. But they own the property. They've really been inclusive thus far so I'm not really worried about it." Without delving into spoilers, Jessica Jones explores the character's history and deals with a very personal vendetta, but by the end, it's clearly setting up Jones for something more, something greater. 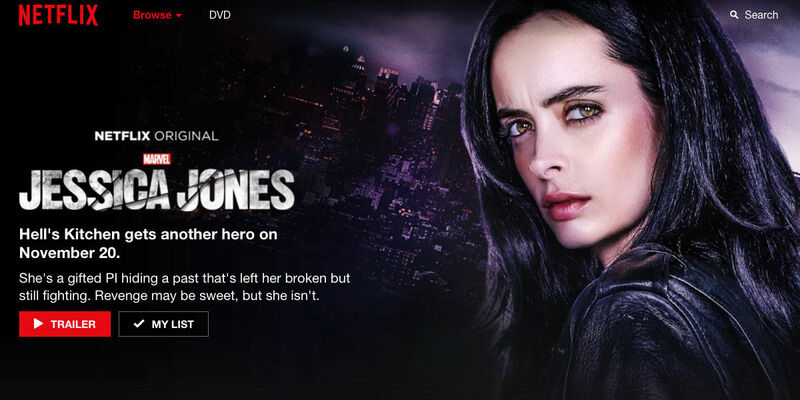 We know her future will tie-in with love interest Luke Cage (Mike Colter) - who also has a major role in Jessica Jones season 1 - so it's possible the Luke Cage series in production right now for debut next year includes Krysten Ritter in some way. Otherwise, it might not be until Defenders, which we can expect in 2017, or 2018 at the latest to be Ritter's next superhero adventure. Next: What’s Going on With Marvel’s Iron Fist on Netflix? Daredevil and Jessica Jones Season 1 are currently available on Netflix. Luke Cage Season 1 and Daredevil Season 2 (a.k.a. Daredevil V Punisher) release in 2016. Iron Fist and The Defenders will arrive sometime thereafter. Captain America: Civil War will release on May 6, 2016, followed by Doctor Strange - November 4, 2016; Guardians of the Galaxy 2 - May 5, 2017; Spider-Man - July 28, 2017; Thor: Ragnarok - November 3, 2017; Black Panther - February 16, 2018; The Avengers: Infinity War Part 1 - May 4, 2018; Ant-Man and the Wasp - July 6, 2018; Captain Marvel - March 8, 2019; The Avengers: Infinity War Part 2 – May 3, 2019; Inhumans – July 12, 2019; and as-yet untitled Marvel movies on May 1, July 10 and November 6, 2020.